BMX stems for old school bike technology. Available in Pro, Pro XL and Pro XXL sizes to fit 1-inch s.. 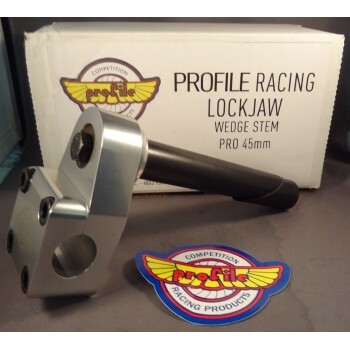 Originally produced in the early 80's, this Retro Re-Issue Lockjaw Wedge stem is available now. Seri..
MINI BMX WEDGE STEMS -BMX stems for old school bike technology. -Aluminum quill and expander wedge..
Old School BMX PROFILE Head Stem Wedge Style Pro XXL-65mm Invert (Black) by ProfileBMX stems for..